While Manchester United's other forwards struggle for goals, Anthony Martial continues to impress. Is he now Jose Mourinho's main man? With Romelu Lukaku benched, all eyes were on Marcus Rashford on Super Sunday. Could he grasp a rare chance in his favoured centre-forward role against Everton? Could he make a case for more regular opportunities through the middle in the future? In the end, though, it was not Rashford but Anthony Martial who made the biggest impression at Old Trafford. From his usual position on the left-hand side of Manchester United's attack, the Frenchman was a constant menace to Marco Silva's side. He was instrumental in the opener, latching onto Paul Pogba's through ball and winning the penalty when he was adjudged to have been brought down by Idrissa Gueye, and his beautiful curling finish for the second goal eventually proved decisive after Gylfi Sigurdsson had pulled one back. Martial could be seen hunched on the Old Trafford turf with his head in his hands at the final whistle having missed a one-on-one opportunity with Jordan Pickford in the dying moments of the game, but he was still a deserving man of the match. As well as his goal and his vital contribution to the opener, there were four scoring chances created for his team-mates. Martial's match-winning performance was a continuation of a fine run of form. The Frenchman only started one of United's first six Premier League games of the campaign following reports of a falling out with Jose Mourinho during pre-season, but he looks undroppable now. His goal was his fifth of the season in all competitions and his fourth in his last three Premier League appearances. Having only played 441 minutes so far, his total gives him the fourth-best minutes-per-goal rate in the division after Chelsea's Eden Hazard, Arsenal's Pierre-Emerick Aubameyang and Manchester City's Sergio Aguero. It is all the more impressive considering only one of his five Premier League starts has come as a central striker, and his prolific run of form comes at a good time for United given the scoring struggles of their other forwards. Rashford, replaced after 65 minutes having only mustered one shot on goal against Everton, has not scored for United in a month, and you have to go back even further in Lukaku's case. Alexis Sanchez, meanwhile, has lost his place in the team having only found the net once all season. Martial has exploded into life at exactly the right moment for Manchester United and it appears he has won over his manager in the process. "I think he coped well with this development process," said Mourinho afterwards. "He took quite a long time to understand what we want from him, it took quite a long time for his brain, and also his body, to be ready to play the way we want him to. 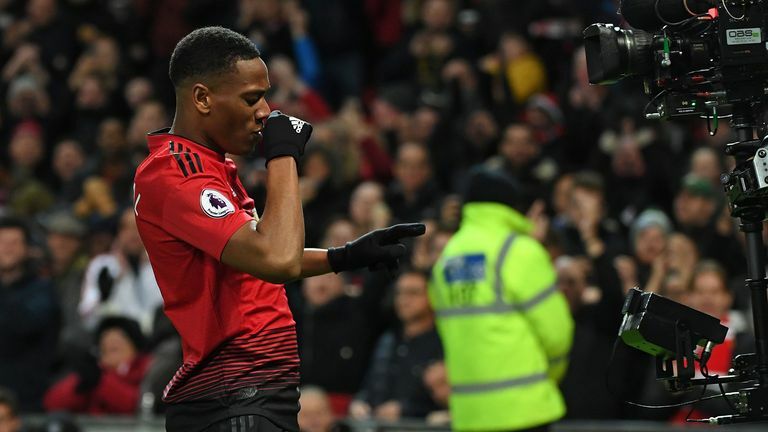 Martial's improved defensive discipline and positioning delighted his manager but it was his attacking contribution which caused most excitement in the Sky Sports studio. "There are signs that [United] are improving and it's mainly because of the guy that got man of the match," said Jamie Redknapp. "He's come into the team in the last few games and made such a difference to them. The pace that he plays with. He won the penalty. He was the decisive man. He has got all the attributes to go right to the top. "I think he's a very special player. I've always believed it," added Graeme Souness. "He's got pace, power, super technique, as we've seen in the last couple of weeks with his goals. He's the full package if he's right. "I think the question marks have been because we see the glimpses and that's the frustration - we see the player that he could potentially go on to be," said Alex Scott. "It's being able to do it consistently, and I think that's what we are seeing now, a player full of confidence and showing up every week in a Man United shirt." Manchester United will hope it continues. 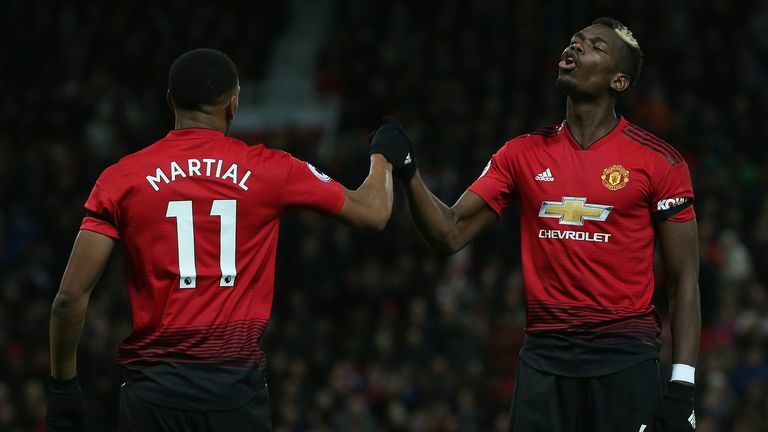 The Frenchman's current contract is due to expire at the end of this season and he has rejected the club's latest offer of an extension, according to Sky sources, but talks are set to continue and his latest performance only added to the feeling that Martial and Manchester United could yet bring out the best in each other. It is quite the turnaround for the 22-year-old. Martial's future looked bleak under Mourinho at the start of the season, but no player has been more important in easing the pressure on the under-fire manager. Right now, Martial is Manchester United and Mourinho's main man.